I was unable to make the Club trip to France this year, having already booked a dream holiday in Hawaii in October with my wife and daughter. I prepared well and had a guide book kindly lent to me from Malcolm. Researching the internet for bike hire on Maui I found a great outfit (www.mauicyclery.com) who rented quality road bikes and even offered fantasy pro team support rides around the island on certain days! This would make a nice change from the beach. I opted for a week’s rental on a Scott road bike with Ultegra compact groupset. Nice bike and much lighter than my Ribble. 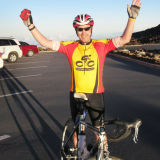 My goal was to cycle the 36-mile road up the Volcano ‘Mt Haleakala’ from sea level to 10,024 ft. above. At the bike shop, the guys adjusted the saddle, blew up the tyres and supplied energy gels and isotonic tablets which in my view would have failed a drugs test on appearance alone. They told me most riders set off around ‘sun up’ but we figured that although it was around 10:30 I should have plenty of time. I mean the fast guys do it in two and a half hours they said (I noticed Lance’s autographed yellow jersey on the wall), and could descend in about an hour! Based on my assault of Bealach na Ba this year (2000ft), I figured it would take me about 5 hours to the top. I set off in the heat of the day on the gentle base slopes but was slowed by the persistent headwind. After a couple of hours and about 4000 ft I was hungry and out of water, so I stopped at the last food stop. ‘Sunrise Café’. I feasted on Coke and a Breakfast Burrito which was the nearest they had to beans on toast. An hour later I set off again plodding up the relentless gradient which was now becoming steeper. At times like this you begin to wonder what you are doing as you are supposed to be on a family holiday. Through the cloud layer, after a few hours, the terrain became lifeless desert and a kind of lonely boredom set in! Eventually I reached the national park gate where they wished me luck and told me they were off home for the day. I saw road signs warning of Cattle and later of ‘Nene’ (an endangered species of native bird). At 9000 ft I stood up on the pedals for a while a la Armstrong but quickly became light headed and had to resume the Indurain sitting position. After 5 hours continuous climbing I slowed as I reached the summit and feeling exhausted I decided to walk the last 100 yards. There were quite a few cars at the top, their occupants waiting to see the sunset. I heard some of them questioning my sanity, but then a lady came up and asked me if I’d ridden up and would I like her to take a picture? A keen cyclist, she was interested, having considered the ride herself. “No Lights!” She said “I’d be worried about getting back down if I were you”. The sun sets pretty quickly here. Right then! I put on my trusty old windproof, and set off. The bike was superb and I was soon descending at amazing speed on super smooth tarmac. The brakes worked perfectly as I rounded countless hairpins, with the setting sun now in my eyes I was forced to slow my average speed. Sunglasses became a burden so I gripped them between my teeth. I was shivering and had to stop to don a base layer. Into the dusk I was beginning to worry about hitting a rare endangered Nene or something when I saw the silhouette of a cow looming out of the darkness! Then another one in the middle of the road caused me to swerve. Twenty minutes later, descending all the way it was now pitch black as the first cars began to catch me. More worried about crashing or stopping in the middle of nowhere, luckily I spotted a yellow call box. Some time later, a squad car arrived, blue lights flashing! What followed was not a happy experience with Maui’s finest but they put me in the back of the cruiser and took me a few miles down to the next village where my wife came to retrieve me. On the way back to our accommodation I recounted my experience. Hey I’m a tourist. I’m cold, hungry, tired and maybe was slightly hypoxic today. I actually think I’m relatively sensible having made a decision to stop. But mainly I’m elated ‘cos I’ve conquered Mt Haleakala! I’m a cyclist you see. Spent the rest of the week on the beach.